Through his own experiences and his empathy for others, Joseph Smith became a strong advocate for religious freedom. Questions about the state of American religious freedom almost certainly swirled in Joseph’s head as he stood amid the rubble, which was located just a few city blocks from historic sites commemorating some of the pivotal battles of the American Revolution. In a country whose constitution enshrined the idea of religious freedom, how could Americans tolerate violence against religious minorities? Furthermore, how could Church members effectively advocate a legal and political culture in which the rights of religious minorities were as protected as the rights of the Protestant Christian majority? And so Joseph began to publicly advocate that the government and his fellow Americans actively foster a society dedicated to allowing all men and women the freedom to worship﻿—or not worship﻿—God according to the dictates of their own consciences. Joseph’s visit to the site of the destroyed convent signaled a related development in his approach to religious freedom. He recognized that he and his followers were not the only religious minorities who had been victimized by mobs. Fighting for his own religious freedom and that of his fellow Church members was not enough. If he was to truly champion religious freedom, he would have to do more than insist on the protection of the citizenship rights for those who believed as he did. He needed to take a stand for the rights of all men and women, especially those whose religious beliefs differed from his. Yet the president’s refusal further fueled Joseph’s commitment to seek redress from the federal government, and he made it clear to Congress that the way it responded to the violent persecution of the Latter-day Saints would send a clear signal to all Americans of the state of religious freedom in the country. 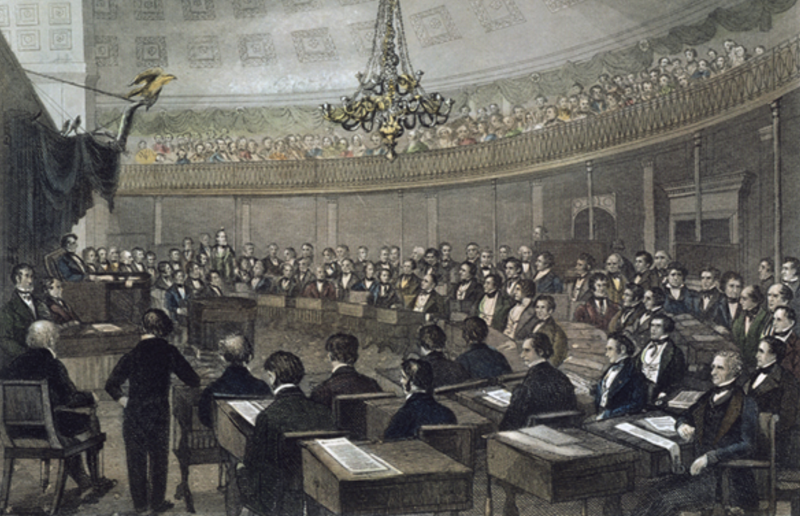 In the Church’s petition submitted to the Senate, Joseph, Sidney, and Elias declared repeatedly that all Americans, regardless of their religious beliefs, should enjoy full citizenship rights.7 While they had come to the nation’s capital because of the persecution of Church members in Missouri, they were advocating the religious freedom of all people. Over the years that followed, the Church continued to send petitions to Congress, each one ending with disappointment. At one point, Joseph wrote to John C. Calhoun, a prominent senator, to explain how the government’s unwillingness to protect religious minorities not only denied the Saints their religious freedom but also threatened the citizenship rights of other Americans simply because of their religious beliefs. The sustained inaction of Congress, Joseph insisted, would declare that an individual state “can exile you at pleasure, mob you with impunity, confiscate your lands and property, [and] have the legislature sanction it﻿—yea, even murder you as an edict of an emperor, and it does no wrong.”10 Once again, Joseph demonstrated that his fight for his own rights and those of his fellow Church members was part of a deeper struggle for peace and equality in human society. Joseph demonstrated by his actions that this was more than lofty rhetoric. For example, in the early 1840s, Father John Alleman, a Catholic priest in Fort Madison, Iowa, was desperate to cross the Mississippi River so he could minister to one of his parishioners who was on his deathbed. When Joseph learned that Father Alleman lacked the means to make the trip, he paid Alleman’s fare for a ferry across the river and then loaned him a horse to make the rest of his trip.13 Aiding the religious practices of his Catholic neighbors in no way compromised his own religious convictions. Instead, it demonstrated Joseph’s commitment to allowing all men and women their rights of conscience. Joseph Smith demonstrated that he could advocate﻿—and even facilitate﻿—the religious worship of others and that doing so neither detracted from his own rights nor signaled a weakness in his own faith. Merely advocating his own religious liberty would not result in universal religious freedom. That would come only if men and women were as ardent in defending the rights of other religious minorities as they were in protecting their own. To learn more about religious freedom and how to protect it, visit ReligiousFreedom.lds.org. See also “Religious Freedom,” Gospel Topics, topics.lds.org. See Nancy Lusignan Schultz, Fire and Roses: The Burning of the Charlestown Convent, 1834 (2000); The Joseph Smith Papers, Documents, Volume 5: October 1835–January 1838, ed. Brent M. Rogers and others (2017), 278, footnote 248. See John Corrill, A Brief History of the Church of Christ of Latter Day Saints, 1839, in The Joseph Smith Papers, Histories, Volume 2: Assigned Histories, 1831–1847, ed. Karen Lynn Davidson and others (2012), 145–49. See Histories, Volume 2: Assigned Histories, 1831–1847, 158–59. See Minutes and Discourses, 5–7 October 1839, in The Joseph Smith Papers, Documents, Volume 7: September 1839–January 1841, ed. Matthew C. Godfrey and others (2018), 23. See Letter to Hyrum Smith and Nauvoo High Council, 5 December 1839, in Documents, Volume 7: September 1839–January 1841, 66–69. See Memorial to the United States Senate and House of Representatives, circa 30 October 1839–27 January 1840, in Documents, Volume 7: September 1839–January 1841, 138–74. See Report of the United States Senate Committee on the Judiciary, 4 March 1840, in Documents, Volume 7: September 1839–January 1841, 542–43. See Minutes and Discourse, 6–8 April 1840, in Documents, Volume 7: September 1839–January 1841, 246–50. Joseph Smith to John C. Calhoun, Jan. 2, 1844, Joseph Smith Collection, Church History Library, Salt Lake City; capitalization and punctuation standardized. “An Ordinance in Relation to Religious Societies,” Times and Seasons, Mar. 1, 1841, 337. Proclamation, 15 January 1841, in Documents, Volume 7: September 1839–January 1841, 508. See History of McDonough County, Illinois (1885), 492.